City Residential have reinforced their long term support for Claire House Children’s Hospice by agreeing to a once a year donation based upon their annual operating profit. Their commitment, which will last indefinitely, will see the firm donate 1% of their pre-tax profits to the Wirral based charity every year. 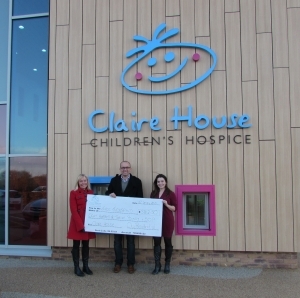 Their first donation saw them presenting a cheque in January for £3,812.50 to Helen Carlson at Claire House (see picture). The ongoing donation from City Residential comes at a time when Claire House are preparing to launch a business club to encourage more businesses to agree to a regular, long term commitment to the charity. City Residential have offered to help recruit supporting companies as part of their support for the Charity. They have also agreed that their sister company Rogerson Bevan Consultancy Ltd will support the charity. If anyone is interested in supporting Claire House or need any further information about the 1% Club or the Business Club please do not hesitate to get in touch. Excellent, timely, relevant communication throughout the entire process of purchasing our new home. City Residential really deliver what they say on the tin, and I have no hesitation to recommend their services and use them again.